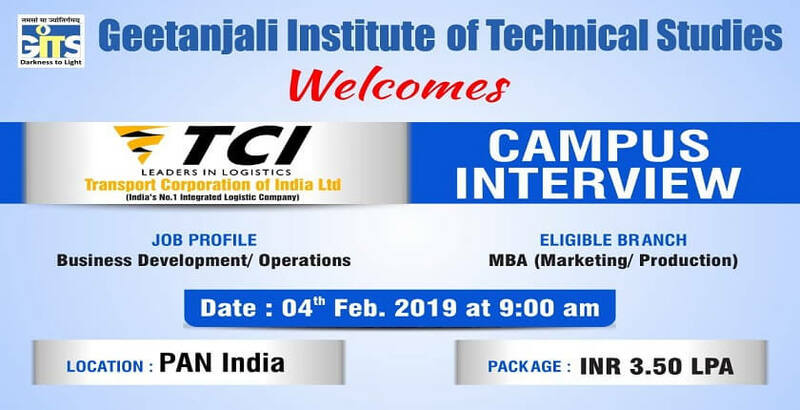 GITS is organizing the Campus Interview of Transport Corporation of India Limited ((India’s No.1 Integrated Logistics Company) for our MBA (Marketing/ Production) 2019 Batch for the Profile of Business Development/ Operations@ Package of INR 3.50 LPA on 4th Feb. 2019 at 9am. Transport Corporation of India Limited is an integrated multi-modal logistics and supply chain solutions provider in India with a Global presence, headquartered in Gurugram, Haryana, India. It was founded in 1958 as a ‘one man one truck’ company by Shri Prabhu Dayal Agarwal. Transport Corporation of India (TCI), with revenues of over Rs.2900 crore, is India’s leading integrated multimodal logistics and supply chain solutions provider. As “Leaders in Logistics”, TCI continuously strives to better existing systems, processes and productivity. With expertise spanning over six decades and infrastructure comprising an extensive network of 1400+ company owned offices, 11 million sq. ft. of warehousing space, a strong team of 6000+ trained employees and a strong foundation, TCI has expanded boundaries to offers seamless multimodal transportation solutions in both Indian and International markets. Developing business in the Branches, supporting controlling & BDO’s for generation of new business, customer prospecting, submitting quotation, finalization of rates, follow up with customers keeping an eye on activities happening in the Region & participating in the same to enhance visibility, organizing customer meet & meeting new clients. Monitoring customer credit & outstanding, following up for timely release of payment MIS is to be generated as per defined timelines, keeping an eye on current market trends, competitors and giving timely feedback to superiors. To have harmonious relationship management with the customer and take proactive steps in customer relationship management. To manage business activities & operations of a Controlling of the Division. Monitoring Direct & indirect cost, outstanding, initiative to reduce direct & in-direct cost, manage profitability, action taken on Audit reports. Business growth as per strategic planning for the current financial year. Timely booking & delivery of consignment, weight adjustment, statutory compliance. Operational processes are to be followed, feedback to Region/ Controlling Office management on operational issues, monitoring execution of operational plan, coordinating with HO for support. All the booking should be as per co. policy and complied with the law customer specific requirement is to be taken care of at the time of booking/ delivery. Timely submission of bills & followed for realization. Customer relationship management, ensuring that customer get the timely service, customer grievances are properly attended. Attending training programs as and when organized, imparting training to team members for reinforcement of company policy and sharpening their skill on the job.